In this guest post, Bonnie McClafferty, Director of Agriculture for Nutrition at GAIN shares her views about the challenges and solutions faced when bringing agriculture and nutrition together to increase food security in our ever-changing world. 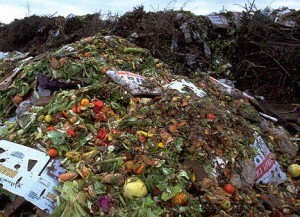 A new report published today by the Institution of Mechanical Engineers details the devastating scale of food waste in the world. The report entitled ‘Global Food: Waste Not, Want Not’ estimates that 50% of all food produced on the planet is lost before we even eat it. This enormous waste of food puts a huge strain on the agriculture sector as it must provide for an increasing population that is wasting up to 2 billion tonnes of food a year. The report suggests that consumer trends are to blame in developed nations: “Supermarkets will often reject entire crops of perfectly edible fruit and vegetables at the farm because they do not meet exacting marketing standards for their physical characteristics”. As a result, up to 30% of the UK’s vegetable crop is never harvested. Supermarket promotions are also suggested as a culprit, encouraging customers to buy excess food that is often thrown away. At the other end of the supply chain, waste is also common in developing countries due to insufficient storage and access to markets for farmers. Grain storage loss not only wastes resources but it can also cost farmers up to 30% of their yield for a season. A growing population and an increase in food waste means farmers are struggling to meet demands without the necessary investments to increase yields. Our food supply is not the only resource under strain though. In the process of producing food agriculture uses 70% of the worlds water supply. For countries that rely on rain-fed agriculture the need to create more food is resulting in a shortage of water as farmers use supplies faster than the rain can replace them. However, investments in agriculture can help cut wasteful water use, according to the report: “Better irrigation can dramatically improve crop yield […] although the drip or trickle irrigation methods are more expensive to install, they can be as much as 33% more efficient in water use”. A further issue is land use, as the report details that agriculture already uses 4.9Gha of the 10Gha land available. Again, consumer attitudes play a crucial role as an increased demand for livestock farming means land is used insufficiently. The report illustrates that one hectare of land producing rice or potatoes can feed up to ten times the amount of people that one hectare of land producing meat can. Eliminating food waste could provide 100% more food and soften the huge strain on agriculture to provide food for a population estimated to reach 9 billion by 2075.